Animation Day in Cannes 2015, Year one : It’s a wrap! Can Animation save the world? Our eclectic panel answered that question with positivity and creative new ideas. Panelists Laurie Gordon, Octavio Nadal, and Bruno Chatelin all from various backgrounds and film experience happily took on the challenge in answering a large and interesting question. In the theme of Horyou.com who’s mission is to make change through the social good, the panel took a life of its own in a free flow of thought and personal insight and experience eventually opening up the dialogue to the audience. Two top prizes from ANIMAZE MIAFF the Montreal Internationa Animation FIlm Festival which took place in Montreal April 16-19, 2015 were awarded to the distributors in absentia of the film directors. Aura Films Distribution (Argentina) and Reel Suspects (France) were fortunately in Cannes and attended Animation Day in Cannes. Zoe RABAYROL of French distribution company Reel Suspects received the SENSUM AWARD for MANIEGGS : REVENGE OF THE HARD EGG on behalf of Hungarian director Zoltan MIKLOSY. The soft launch of the Ryan Larkin Foundation which will help support new artistic endeavours of mid career and pedigree animators and directors who have taken a not always voluntary hiatus from filmmaking, who have experienced unexpected life or career change was announced by Laurie Gordon. Ms. Gordon spoke to the audience about her personal and professional experience working with the late Canadian animator. An inagaural launch of the foundation in Cannes 2016 is being considered. Nagidmy Marquez VP Communications Horyou took the opening remarks telling the Cannes audience about Horyou’s mandate and mission. Based in Switzerland, Horyou continue its activities throughout the year and hold an event SIGEF – Social Innovation and Global Ethics Forum in Geneva in October hosting local and regional personalities as well as inviting international guests from all over the world who have a mission to share with the world. 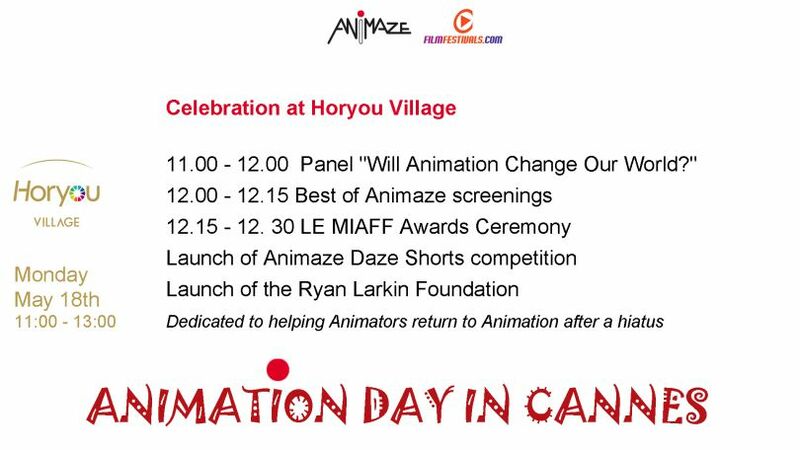 Watch out for Animation Day in Cannes on the road. Next stops Annecy June 15-20 and Montreal dates in August to be announced. Thank you for watching filmfestivals.com !